Device Guard and the enlightened scripting environments that come with it are a lethal combination for disrupting attacker activity. Device Guard will prevent unapproved code from executing while placing scripting languages such as PowerShell and the Windows Scripting Host in a locked down state. In order to operate in such an environment, researching bypasses can be immensely useful. Additionally, there are evasion advantages that can come with executing unsigned code via signed/approved scripts or programs. When hunting for Constrained Language Mode (CLM) bypasses in the context of Device Guard, investigating Microsoft-signed PowerShell modules for calls that allow arbitrary, unsigned code to be executed is always a fruitful endeavor as most Microsoft PowerShell modules will be signed (i.e. implicitly approved per policy). To combat abusing signed PowerShell modules to circumvent CLM, Microsoft added a check to make sure a module can only execute exported functions if the module is loaded in CLM (CVE-2017-8715). This means that, while a script may be signed and allowed per policy, that script can only execute functions that are explicitly exported via Export-ModuleMember. This addition significantly reduces the attack surface for signed PowerShell modules as non-exported functions will be subject to CLM, the same as unsigned code. 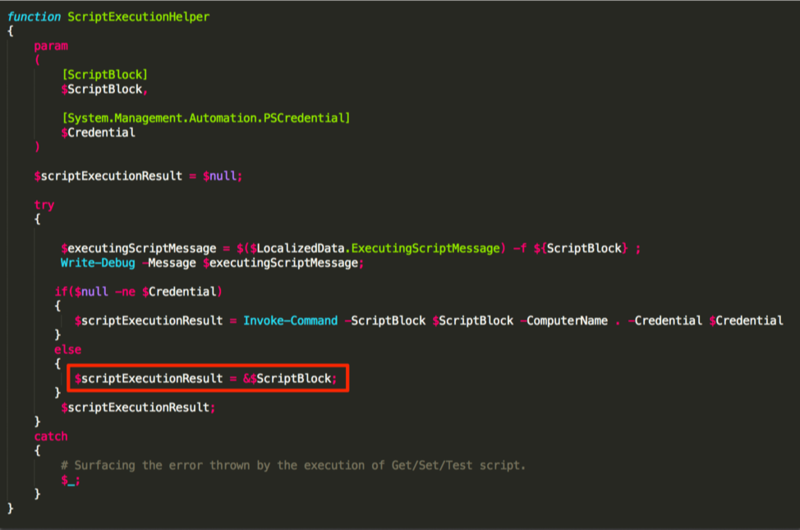 Looking at this function, the code passed via -GetScript is added to a new scriptblock via [ScriptBlock]::Create(). After doing so, it passes the psboundparameters to the function “ScriptExecutionHelper”. As you can see above, we are running in ConstrainedLanguage mode and getting the square root of 4 fails as those method calls are blocked. We then add our “malicious” code to the $code variable. 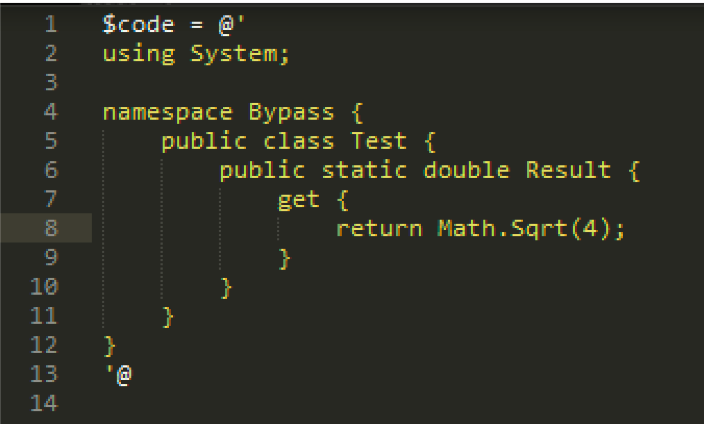 All this code does is take the SquareRoot of 4, like we previously tried to do. Once that is done, the “MSFT_ScriptResource” module is imported and our “malicious” code is passed to “Get-TargetResource” via the -GetScript parameter. When that executes, the Add-Type call is executed and our “malicious” code is executed, thus circumventing CLM on Device Guard. 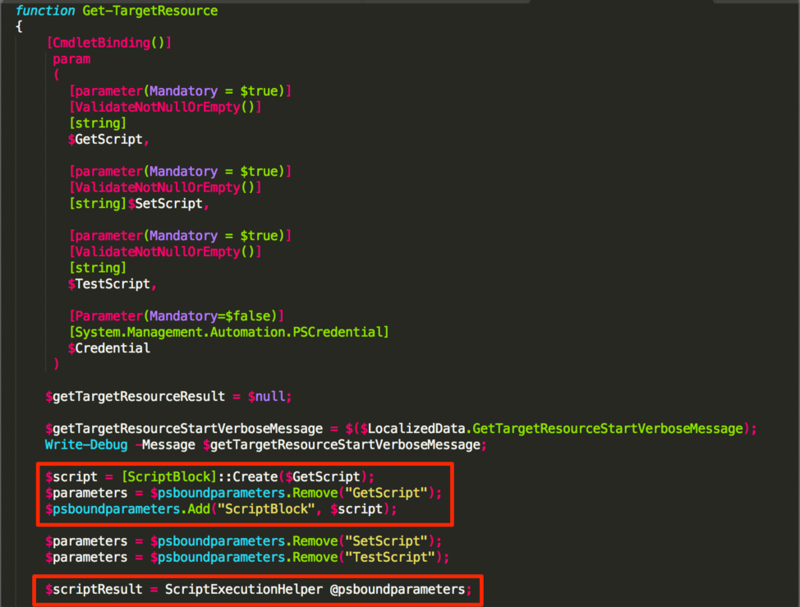 It should be noted that enabling ScriptBlock logging will still capture the CLM bypass attempt.